Ricoh Europe has developed new authoring capabilities for Clickable Paper™ that will enable companies to deliver a more responsive client-centric service. Ricoh is also launching customisation software during the second half of 2015 that will allow clients to embed Clickable Paper into their own branded apps. Clickable Paper is an image recognition technology based on Ricoh Visual Search technology developed by Ricoh Innovations. It allows printed materials to be repurposed without marking, editing or reformatting the source documents. Hotspots are used to link to rich media from related authored content, end-user contributed social information or calls to action such as tweets, maps, calls and emails. The technology allows communication to be taken beyond the page to deliver far-reaching value to readers by levering rich media sources. He adds that putting the authoring capability in the hands of users will help make the production process smoother and enable Barnwell to better support more happy clients like a well know Norfolk Broads cruise operator who used Clickable Paper to link a hotspot to a 360 degree tour of one of its boats. After seeing the spike in viewings Clickable Paper delivered, the company decided to drive bookings by producing similar videos of the rest of the fleet. 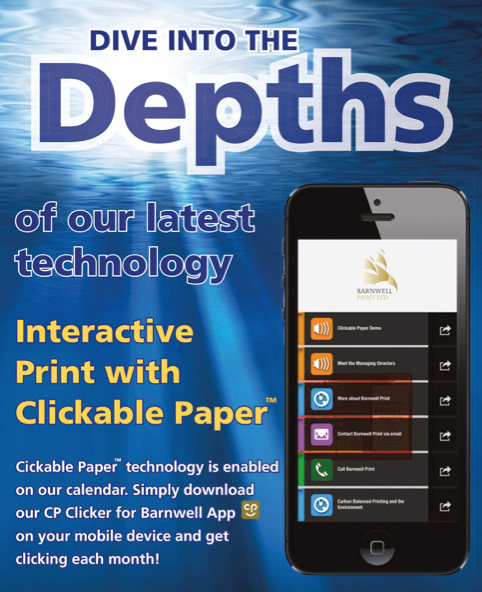 The next step in Clickable Paper’s development is the branding of hotspots in clients’ corporate livery. This approach has been market tested and will now be made available Europe-wide.